Co-funding of the participation of Ph.D. students in short international exchanges such as research internships, workshops, etc., which are closely related to the subjects of their Ph.D. theses; co-funding includes visits of NCU Ph.D. students abroad and internships of foreign Ph.D. students at NCU. Participants of the project can obtain funding to cover the expenses of the accomodation and travel as well as to cover the participation fee in e.g., a conference (for NCU students going abroad). The project involved two calls. The first call was closed on October 30th, 2018. There were 37 applications among PhD students; the Selection Committee awarded 18 PhD students willing to participate in 9 research stays and 9 conferences. 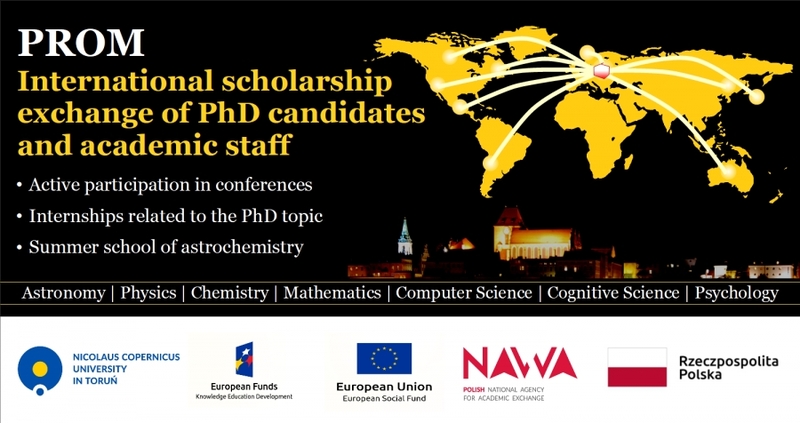 Full list of laureates of the first call is available on the project website [link: https://www.fizyka.umk.pl/panel/wp-content/uploads/PROM_1st_recruitment_results_www.pdf]. The deadline for the second, final call in the project is January 25th, 2019. The results of the call will be announced on February 17th, 2019. Applications in English by international students shall be sent by email to Dr. Justyna Cembrzyńska (j.cembrzynska@faj.org.pl; participation in the TASQ school) or Dr. Agata Karska (agata.karska@umk.pl; research stays).